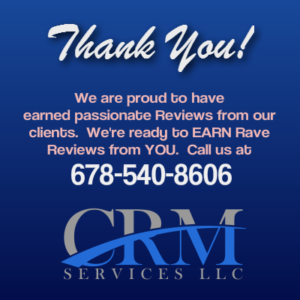 The entire team at CRM Services LLC is proud and grateful for all the passionate Reviews about our exceptional service. We take Total Client Satisfaction very seriously – every day. We welcome YOUR Review, too! CLICK HERE and complete our online Review Form. “I had two emergency situations with flooding at my house and my business place. I called Quincy in a panic, once I saw my basement flooded. He calmed me down over the phone & in less than half an hour his team of workers were at my house assessing the situation and began their work. “CRM is a team of well trained and qualified personnel. On 2/06/15 I experienced the worst moment of my life when I arrived home from a 5 day cruise to walk into my home seeing water pouring over my staircase. In a panic, my husband and I ran up the stairs to see our supply line from the toilet in our master bedroom had ruptured. After about 15 minutes of trying to turn the water off, we couldn’t find the shut-off. My husband searched the web for a water damage restoration company and after calling 2 companies with no answer. He then called CRM Services and got a live person on the second ring. Within 40 minutes of the call, Mr. Earl Allen with CRM Services was at our property and shut the water off within minutes of arriving. Fifteen minutes later, a team of 8 people was there removing water, moving furniture, padding furniture, etc. After 6 hours of constant work by the CRM team, all water was out, our furniture was blocked and machines were placed in our home to remove moisture from the structure that was explained by Mr. Allen. In 4 days our home was completely dried as Mr. Allen had promised and the repairs began 2 days after the equipment was removed. We came home from a cruise to find a flooded house from a ruptured pipe. In less than an hour from my call to CRM, they had a team of 8 people at our house. The CRM staff was very professional throughout the 6-day process, billed the insurance company with no out-of-pocket cost to us. I highly recommend CRM. We were extremely happy with the service we received when our water heater burst on a Sunday morning! They did everything they said they would do. The workers were polite and prompt. I will recommend CRM to everyone I know that has a need for restoration services. I had two emergency situations with flooding at my house and my business. In less than half an hour after my call to CRM, a team of workers were at my house assessing the situation and began their work. Working with the staff of CRM was a wonderful experience. They are exceptional.